Panera’s CopyCat Broccoli and Cheddar Instant Pot soup are probably hands down one of my favorite items to order off the menu. 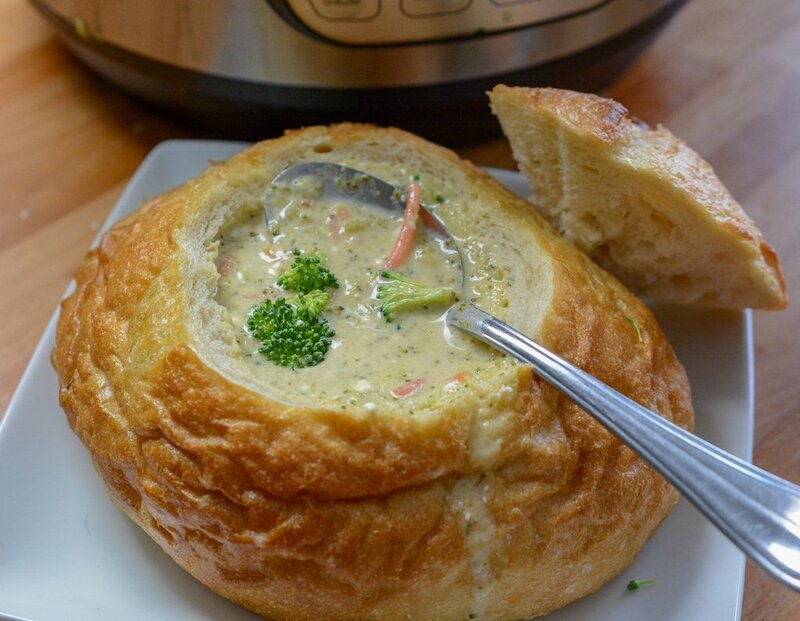 Whether you get it in a bread bowl or a regular bowl this soup is perfection. 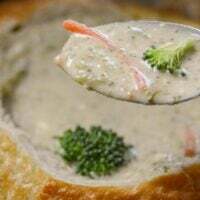 You have that creamy and cheesy texture with pieces of broccoli and carrots throughout that make each bite a little piece of heaven. I love Panera but I don’t want to hop in my car every time I get a craving, so I created a copycat broccoli cheese Instant Pot soup that gives you the same creamy and flavorful soup, you dream about. Panera’s Copycat Broccoli and Cheddar Instant Pot soup are also probably one of the most comforting soups you can make, plus broccoli is great to incorporate into your diet. I will share the amazing benefits of broccoli below, and it might make you even more excited to serve up this soup with your family. This soup takes just 15 minutes to cook in your Instant Pot so not only is it delicious but it is super fast to whip up! If you go the slow cooker route on this recipe, it cooks for hours, so the Instant Pot once again comes in to save the day! 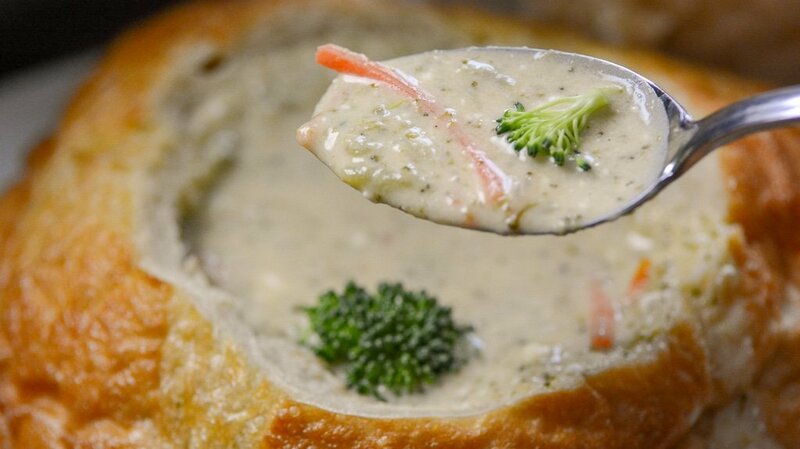 When I was working in the clinic we use to order takeout from Panera’s I always got the Cheddar and Broccoli Soup in a bread bowl. I could not wait to convert this recipe to Panera’s Copy Cat Broccoli and Cheddar Instant Pot Soup. I love all types of Instant Pot Soups I think it’s my new obsession. I really like CopyCat Instant Pot Soups Like Panera’s Chicken and Wild Rice Soup, Olive Garden’s Zuppa Toscana Instant Pot Soup, and regular Loaded Potato Soup in the Instant Pot. My personal version of the Panera Broccoli Cheddar Soup has around 9 carbs per serving. This makes for a really light lunch or even dinner option. Now if you pair with the bread, of course, you need to factor that in. To make this recipe vegetarian just use a vegetable broth in replace of the chicken stock. It will adjust the flavor slightly but it will be a minimal difference. You can indeed swap out fresh or frozen in this recipe. I personally used fresh broccoli but feel free to grab frozen if it is what you have on hand. Broccoli, cheddar cheese, onion, stock, milk, carrots, hot sauce, nutmeg, and cream cheese are all that are required for this soup. You would think a lot goes into making this broccoli cheddar soup, but truthfully it is such a simple recipe. You will keep coming back making it again and again! You can freeze broccoli cheese soup. Just place in an airtight container and allow some space for it to expand as it freezes. Or reach for a freezer bag to store it in. The soup will stay good for up to 2 months when properly frozen. The cream cheese or heavy cream could change the texture slightly but it will still taste the same. Thaw the night before you want to serve, and reheat on the stove on low heat, stirring frequently to prevent burning. Use a whisk to help give it that creamy texture again, instead of clumpy. If you didn’t set your broccoli cheese soup out the night before, don’t stress I have options for you! Run your bag or container of soup under hot water, sealed up. This will help to defrost the soup faster than sitting in the fridge. Or you can toss in the microwave at 50% power for around 2 minutes. Check and see how it is, then gives a good stir. If it is working slowly, place back in the microwave. Heat on full power for 1-minute increments stirring until it is soft enough to transfer to the pan, or just heat fully in the microwave. You can expect your broccoli cheddar soup to last 3 days in the refrigerator when properly stored. If I know we won’t eat the leftovers in time, I just pop in the freezer for quick lunch or dinner later on down the line. Looking to add some toppings for your soup? Here are some tasty ideas you might really enjoy. Broccoli is one awesome food to incorporate into your diet and has many health benefits. It is packed full of a variety of essential vitamins and minerals, but it has fiber, and is low in calories! Research shows that broccoli might contain anti-cancer properties, as it has sulforaphane, but they need more research to fully back this claim. But to even know that it is a possibility, it is worth considering to incorporate more broccoli into our daily diet. If you didn’t know cooked broccoli (1 cup) has the same amount of vitamin C you would find in an orange. This is great to serve up in the winter months when flu and colds are lurking and you want to make sure each member of the family gets the most vitamin C as possible to help boost your immunity. With this soup, it is so cheesy and creamy that it masks the broccoli and can be great for those picky eaters. 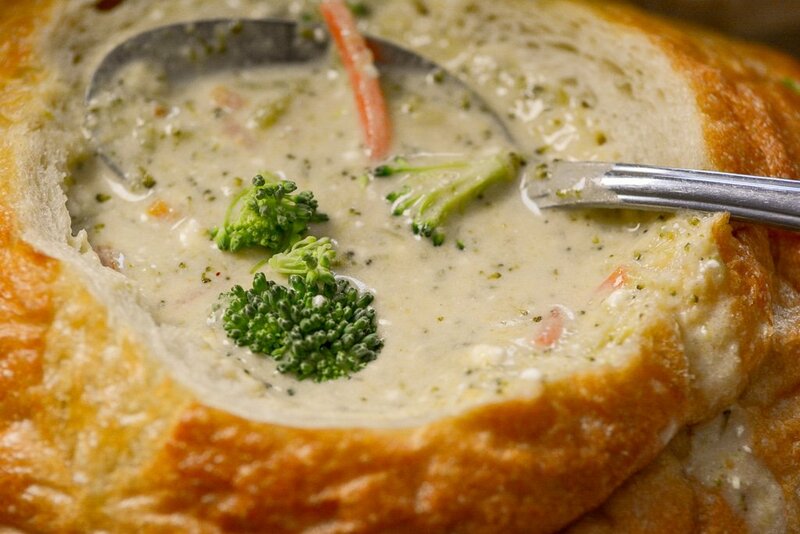 They might dive into this soup without even realizing it has broccoli in it! I hope you all enjoy this scrumptious copycat recipe, I know our family loves it! Update on the recipe: If you add 8oz of cream cheese you will not need a thickener 🙂 Also make sure you stir in the hot sauce after all cheese is melted. Creamy and Delicious warms up your soul. This is actually better than Panera's soup and done right at home. Place chopped onion, carrots, broccoli, Nutmeg, and chicken broth in the Pot. Place on Manual high pressure for 15 minutes. Do a quick release and stir in milk or heavy cream. Stir in cheese and hot sauce after cheese is melted. Serve with bread or crackers. Stir in a dash of hot sauce after cheese is melted to enhance the flavor. I made this yesterday and yum yum. Thanks love using the instant pot. I did put lid on, left on vent but how do I sauté for 5 minutes? It didn’t allow me to set time for 5 or do I time myself ? You don’t put the lid on for saute. The pot actually won’t let you saute with the lid on. After all the pressure is released you can open it and leave the lid off (use something long to manually release the steam or you will be burned). Hit cancel to stop the Keep Warm function and then keeping the lid off press Saute button. Keep lid off during the saute function. You can’t sauté with lid on. Must leave lid off to use sauté function. ? What I understand from other recipes is that you don’t put the lid on while using the sauté mode. You use it like you would a pot on the stove. You don’t have to put the lid back on. You just press CANCEL then select SAUTE then wait for it to have a low boil. I just timed myself then turned it off. Made this. 6 big bowl servings. Very good. This recipe is perfection! I made it for myself for lunch today, and the only thing I didn’t have on-hand was Frank’s Hot Sauce. I ended up using Cholula, and it was still SO good. I actually had some again after dinner as my “dessert”. Ha! How many people would this feed? a full pound of pasta so 4? I made this recipe using milk because it’s less fattening and the recipe calls for milk or cream. The soup tasted delicious but the cheese was clumpy and it separated. Ended up not creamy at all. Do you have a solution to this because I loved the flavour of the soup? I would spinkle in cheese slowly, 1/4 cup and a rime and stir so it will melt and incorporate with the hot liquid a little more easily. Freshly shred your own cheese instead of using pre-shredded bagged cheese which contains cellulose powder. The cellulose powder inhibits the cheese from breaking down. Also, use low heat to melt the cheese, as high temperature may cause lumps in the cheese sauce. I just made it and had the same problem. Did you ever learn of a way to fix it? I just made it and the consistency was perfect until I added hot sauce. I think the vinegar in the hot sauce curdled the milk? Maybe add it very last once it’s all mixed very well and cooled off? Velveeta cheese. I know it sounds gross, but it made it SO much better. This was really watery and kind of bland. If I were to make it again, I’d only use a cup of broth. So just got done making this today. I realized after it was too late that I didn’t follow the directions and instead added all ingredients in at the same time (but I used a bit of extra broccoli and an extra 4 oz of cheese)… so, I went with it and hoped for the best. Even still, I think it turned out really great… only thing I added afterward was a little more hot sauce. Curious how it’ll turn out next time I make it when I actually follow the directions properly! The taste of this was fantastic! I added 2T of cornstarch at the end to thicken it up. The same way – the insta pot is nothing but a regular pressure cooker. 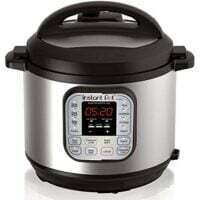 I use my much less expensive ones that were higher rated and just use the soup/stew button or if you don’t have one – just pressure cooker for 10 minutes. I made this recipe for a friend with a slight reduction of the chicken broth and about four extra ounces of cheese. She and her husband absolutely loved it! They have now asked me how to make it. But, I only know how to do it with the instant pot and they don’t have one. Would you have any idea how to make this recipe regularly? There’s a great stovetop recipe on Pioneer Woman’s website. I made this tonight and it was a big failure. My cheese separated and the rest was watery. Maybe I used the wrong kind of cheese. I see a lot of people had luck with this so I guess I just did something wrong. Did you shred your own cheese? Definitely get a block and shred your own instead of using pre shredded. It makes a big difference. I just made it and the same thing happened to me, too. I grated my own cheese. Such a bummer! I can’t figure out how to fix it. I used mild cheddar (grated it myself) and think that’s the key. Sharp cheese doesn’t melt as easily. I added half of it, stirred it in until it melted completely, then added the rest and stirred again. I used medium cheddar, shredded it myself….added it gradually. No problems with clumping. It separated for me every time when I brought it back to a boil. Once the pressure cooking is done, just throw in the rest of the ingredients and use the “keep warm” function until it’s all melted. Would this freeze well? I love the Panera soup but I am the only one who eats it so if I made a whole pot I need to freeze. Would you be able to use frozen broccoli instead and to compensate for the extra liquid that will come from the broccoli reduce the amount of broth? I used frozen and it turned out just fine! I didn’t change anything else, I just put the broccoli in frozen straight from the bag! Thank you so much for posting the tip. I was reading through the comments to see if anyone had tried frozen broccoli! I look forward to trying this soon! Could the recipe be halved and use the same time? I’ve a 3 qt IP and halved everything ( a put a bit more shredded cheese. Turned out great. I add smoked diced ham to it and it’s my son’s favorite meal! I agree with a little less broth and more cheese. I’ve used the pre shredded tillamook brand successfully. Tasted good but the cheese curdled when I added it. I added it very slowly and it was freshly grated. Not creamy or thick at all. I added seasoning. But overall decent taste. Just the appearance is a bit disappointing, especially considering that with how expensive cheese and broccoli are here, this is a pretty expensive soup for me to make. I’ll probably use this recipe as a guide in the future and change a few things to hopefully get the cheese and seasoning to my preference. I made a roux with 2 T of butter, 2 T flour and added just 1 cup of milk and the cheese, then added that to the cooked broccoli-broth mixture and got a creamy texture! Made this tonight and halved the recipe with no problem. The only thing I did different was thicken it with a little cornstarch. at the end. Really good flavor! My cheese melted just fine, it was Kraft that I grated myself. (I thought it wasn’t melting and was stirring furiously, then I realized it was the carrots I was trying to melt – ha ha) I chopped the broccoli in my food processor and went a little overboard to it was more like a puree. Next time I will chop it into small pieces instead. Will definitely make again, my daughter loves this soup from Panera. This will be so great on cold winter days! You can’t just use straight cheddar cheese. You have to melt it in a roux mixture. Take equal amount of flour and butter and melt together. Then pour in the milk or cream and cook on low-mend heat until thickened and smooth. Then pour this into the broth veggie mixture. I made some adjustments to this…used 2 cups of veggie broth and blended the mixture a bit after it was done. I also made a roux with 2tbs butter/2tbsp flour on the stovetop, then added the milk and cheese to make a cheese sauce. I added this to the broccoli mixture and topped off with salt/pepper and tobacco (that’s what I had on hand). Delicious and perfect consistency for me. Thanks for sharing this recipe! Definitely will make again. I just made this tonight as written and it is wonderful. Thank you! This is such a deliciously good recipe! I’m glad I halved it for my mini, otherwise I’d’ve eaten the whole pot. YUM! Next time I’d add flour or something to thicken it, more cheese, and I’d double the whole recipe lol. But that’s just me. It was still very good as is! Everything was cooked perfectly in 15 mins which is amazing because usually when I make this on the stovetop it takes an hour! This was fantastic. I added 2 cloves of minced garlic, 2 tsp. Fresh parsley & thyme, some dried oregano and sauted it in the instant pot with the onion and grated carrot prior to adding the remaining veggies. I also added 4 cups of low sodium chicken stock, but cut back on the dairy to 1 cup milk with 2 Tbsp. wisked in flour at the end with some fresh ground nutmeg. Cut back to 1.5 cups of cheese and used my immersion blender to smooth it out a little bit. Could you add potatoes to this? Am I able to use frozen broccoli instead? How wild the recipe need to be changed? Thank you! Do NOT let this boil. The cream will break. The broccoli disintegrates. This soup is so good and so easy, just chop, dump and cook. While the soup was coming back to a boil I blitzed it smooth with my immersion blender, then stirred in freshly-grated mild cheddar (it melts so beautifully!) and only 2 teaspoons of Sriracha (Mom can’t handle any heat at all, but I think I could have used a bit more and been fine). It came out smooth, silky and very luxurious. Everyone loved it, so I knew it was a keeper, but I didn’t realize it was THE keeper (no need to look further, this is the one) until tonight when my husband hoovered up all of the leftovers, every drop. He seldom goes for leftover soup, so I knew I had a winner on my hands. Thanks! Omg just make this and it was amazing! First thing i have made in my Instant Pot. I changed a round a few thing to make it thick and less fattening. I only used two cups of chicken broth, because i wanted it thick. Then i used 1% milk, but mixed in 2tbs per cup of corn starch. And used cheese made with 2% milk. Oh and i used frozen broccoli because I’m lazy lol. It came out soooo good! This recipe is not only delicious, but so easy! The only modification I made was I actually sautéed my onions in the Instapot first. Definitely will make this again. Anyone try using velveeta cheese instead? I’m going to try velvetta and a can of cream of celery soup. Pioneer woman’s recipe in a slow cooker. Hopefully it works in a instant pot as well. Amazing! How much do you consider a serving size? I want to thank you. I have been trying to figure out an easy/lazy way to be able to make soup like this. This recipe was so simple. My only complaint was that it was a little bit watery, but I did what someone suggested which was to put in more cheese. I tried this recipe 3 times, and the cheddar cheese seemed to separate, giving it an unusual texture. The next time I used Velveeta and it was excellent. Thanks for this recipe. I’ve made it multiple times. A tip I can share is to let the soup cool just a bit before adding the milk or cream, and then stir it in a little at a time. Add the cheese a little at a time too. I didn’t do those things the first time I made the soup and it curdled. Still tasted good, but it wasn’t pretty! Followed the directions and it came out perfect! Thanks for the recipe! Has anyone ever tried to put the broccoli, carrots and onions in a blender or food processor before pressure cooking? I think I would want the soup more smooth. I made this and it was AH-MAZ-ING!!! I actually had never personally had Panera’s version but a co-worker of mine has. It’s her favorite soup! So I used her as my taste tester/comparison guru. She said it tasted exactly like Panera’s (actually she said it was a little better even) and begged for the recipe. Thank you so much for all the amazing recipes you give us! I had bacon to it. I love easy to make it. I’ve made this recipe twice, and the same thing has happened…. came out watery and the cheese clumps. I shredded my own cheese and added it into the pot slowly. Same result. Tastes ok though, the cheese just makes it chewy and not very pleasing to look at. Can you please tell me how much one serving is? I made this tonight – used a little more broth and doubled the cheese. I used pre-shredded cheese and it melted with no problem. I added a little cornstarch to thicken and had crusty french bread with it- absolutely delicious!! Also added some pepper. Leftovers for the week too! Amazing! So easy and delicious. My son hasn’t been feeling well and I made this soup. He ate 2 bowls. Definitely a keeper. Quick release on the pot after 15 min, remove lid and add cream cheese-correct? I’m confused by the directions in the broccoli cheddar soup . Do the 15 minutes on high pressure , then add the cream cheese ? When does the quick release come in? Thank you . When exact do you add in the cream cheese? Before you pressure cook it for 15 minutes or after you quick release and add it with the heavy cream? I’m confused as to when to add the cream cheese. I’m confused about step 3. you can’t add something before quick releasing????? other than that the soup was SO good. It just was pretty thin. any ideas? I put my cream cheese in before pressure cooking. I also added the milk. Totally by accident but it worked out. I only pressure cooked it for about 8 minutes on high. Then I release the pressure and sauteed for about 3 to 4 minutes until it began to Bubble. While it was sauteeing I grabbed my immersion blender and blended until smooth enough for my liking. I added the cheese which was shredded mixture of Velveeta shreds and kraft mild cheddar. Came out perfect. Wow, amazing, I made it but increased the broccoli to 700 g instead of 454 and followed the recipe. I did add 2t cornstarch mixed with water and added it near the end. Holly Guacamole it was impressive. WOW!!!! Had leftovers at the office today and everyone wants to have some. LOL. Note it’s thicker the second day. PS I skipped the hot sauce, didn’t like the taste. I used the cream cheese and whole milk. I also changed a few things… 2 cup of stock and I slightly sautéed the onion, celery and the carrot in a mix of butter and tsp. of bacon grease. before pressure cooking. I also used 8 oz of mild and 4 oz of sharp cheddar. I slowly added the cheese making sure prior batch was melted. This was a pretty thick soup. I used the recommended 15 mins to cook under pressure and I really wish I only did 10 mins. My family really enjoyed this. I will definitely make this again with just minor changes to my preference. What is the thickener I don’t need if I add the cream cheese? I made this today and it came out great! I did alter a few things: i used 2&1\2 cups of chicken broth instead of 3, made and roux for the cheese before adding it in, included ground mustard, garlic powder, a dash of cayenne,and lots of pepper, then thickened it up with some corn starch. Yum! 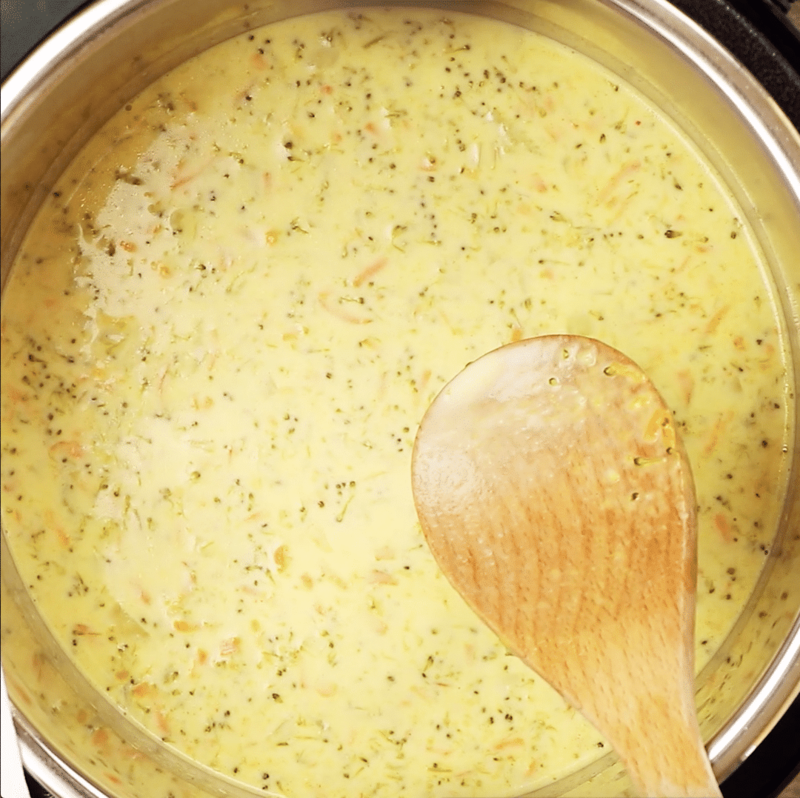 To avoid clumpy cheese, either make a roux or use condensed cheddar cheese soup. Still tastes amazing! Made this tonight in 30 min with cleanup! Made it just as instructed with the exception of adding some salt and pepper. It turned out amazing. I just used store bought shredded cheddar cheese and it encorporated beautifully. Per the instructions you are not supposed to bring to a boil and I wonder if that’s why some were having issues. The only thing I thought was a little strange was my cream cheese had not melted all the way after the 15 min of pressure cooking. I used a wisk while on sauté as I added the shredded cheese and that also helped the cream cheese breakdown. I thought this was delicious. I am in love with my instant pot! we cut up the cream cheese, and added it after we added broth. then placed pot on Manual high pressure for 15 min. The cream cheese remained lumpy, like it didnt melt. what did i do wrong. loved the soup, ended up putting a little corn starch to thicken. Made this tonight. Didn’t bother with the shredded carrots. Came out perfect… it was absolutely delicious! Super filling! I added Louisiana hot sauce at the end and it was the perfect addition. Will definitely be making this again in the near future. I made this tonight in my Pampered Chef Quick Cooker. It was SOOOO good! Spot on! I’m going to make it in my PC quick cooker also. Can it be doubled? Any recommended changes? I had no problems with the cheese curdling. It’s got to be the hot sauce. We don’t even keep that in the house so I didn’t use it. I have made many dishes in the IP where you add cheese at the end then saute and bring to a boil and it’s never curdled. I always use Kraft or Sargento pre shredded cheese in the bag I never shred it myself so I don’t think that’s the problem. It’s gotta be the hot sauce. IMO it didn’t need the cream cheese. I’ve made this many times on the stove top and didn’t need it and it didn’t really add anything to the dish except more calories and more expense. You can achieve the same with some cornstarch if it isn’t thick enough. Also next time I would steam the broccoli by itself first then add it at the end. I did this in 8 mins and it was still mush as I stirred it. Tasted good but I like to actually have broccoli that I can see and feel. Wait….so if I use cream cheese, skip the milk or heavy cream? I did both and mine is super thin!! This was really good! I ended up leaving out the nutmeg, and adding a bit more salt. Definitely a keeper! Thanks. Made this today and it was so good! I will definitely be making this again. can i use frozen brocolli in this recipe or should I microwave the frozen brocolli first before adding to instant pot?